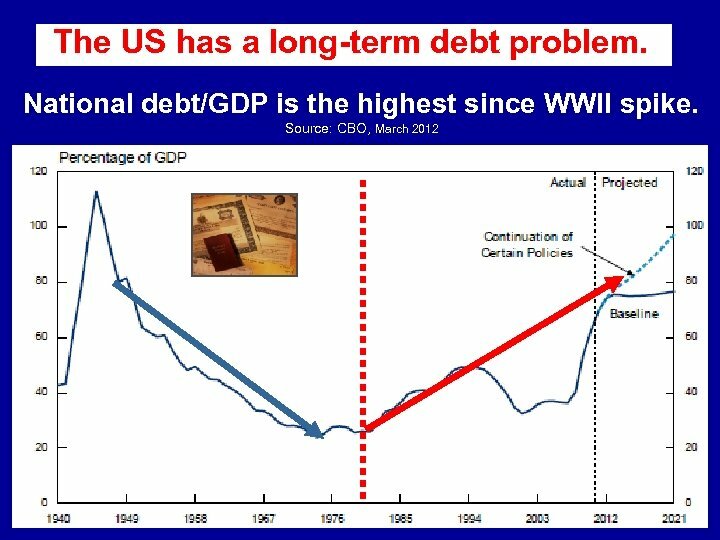 The US has a long-term debt problem, continued • “Long-term” in the sense that debt/GDP will rise alarmingly after the 2020 s – unless entitlements are put on a sound footing: • Social Security & Medicare due to run big deficits – as the baby-boomers retire (predictably) – and the cost of health care rises rapidly (less predictably). 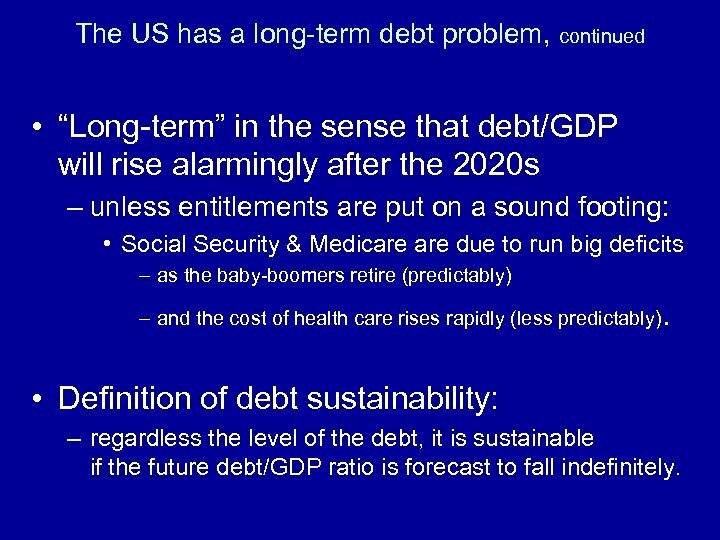 • Definition of debt sustainability: – regardless the level of the debt, it is sustainable if the future debt/GDP ratio is forecast to fall indefinitely. Long-term debt problem, continued • There is not a short-term problem: – Far from tiring of absorbing ever-greater levels of US treasury securities, global investors continue happily to lend at record-low interest rates (2008 -13): • The US enjoys safe-haven status; the $ enjoys “exorbitant privilege. 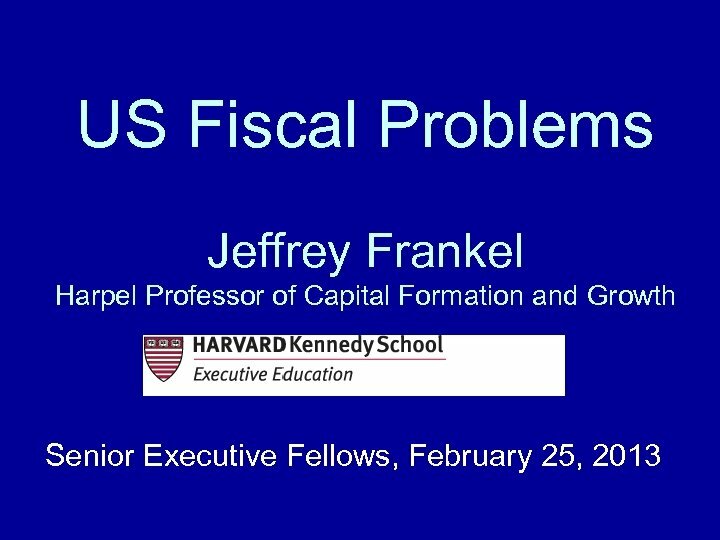 ” – There is no fiscal crisis. 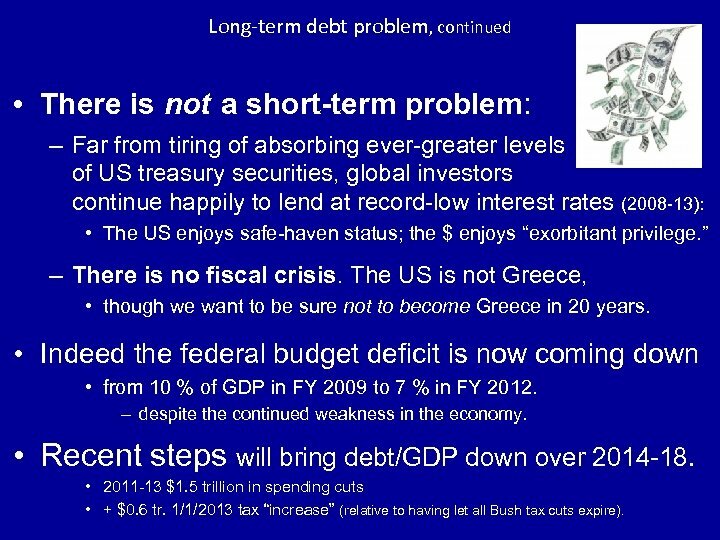 The US is not Greece, • though we want to be sure not to become Greece in 20 years. • Indeed the federal budget deficit is now coming down • from 10 % of GDP in FY 2009 to 7 % in FY 2012. – despite the continued weakness in the economy. • Recent steps will bring debt/GDP down over 2014 -18. • 2011 -13 $1. 5 trillion in spending cuts • + $0. 6 tr. 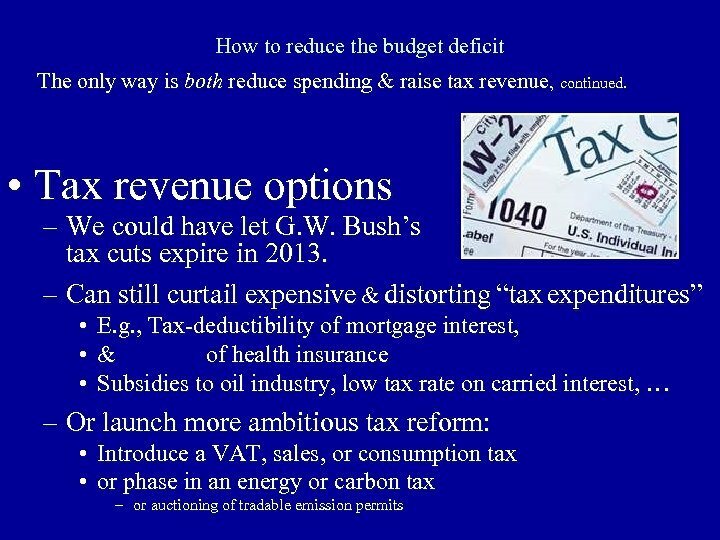 1/1/2013 tax “increase” (relative to having let all Bush tax cuts expire). Debt/GDP is set to decline over 2014 -18. 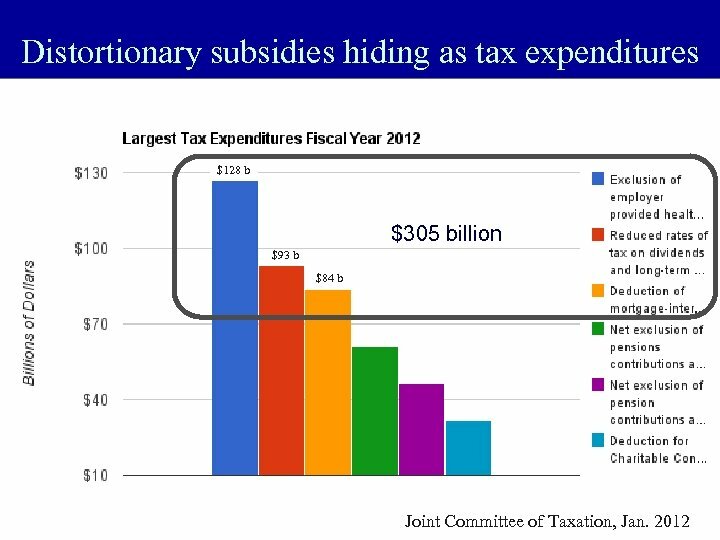 Center on Budget and Policy Priorities, Jan. 9, 2013 http: //www. cbpp. org/cms/index. cfm? fa=view&id=3885 CBPP recommends a further $1. 2 tr. 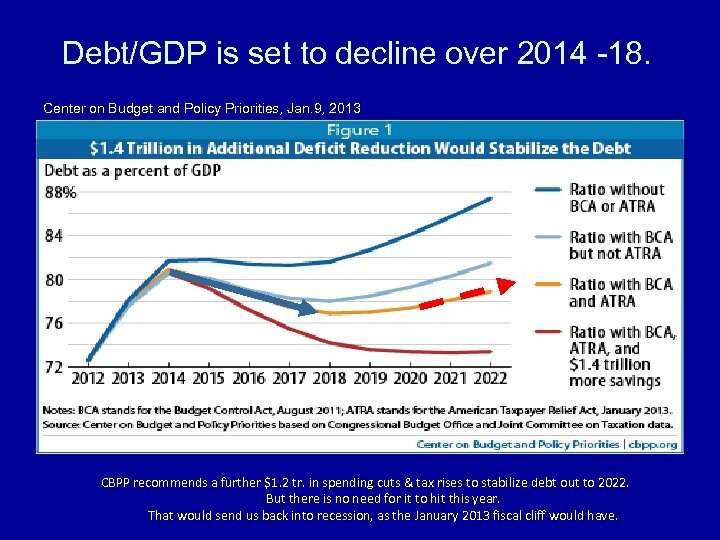 in spending cuts & tax rises to stabilize debt out to 2022. But there is no need for it to hit this year. That would send us back into recession, as the January 2013 fiscal cliff would have. 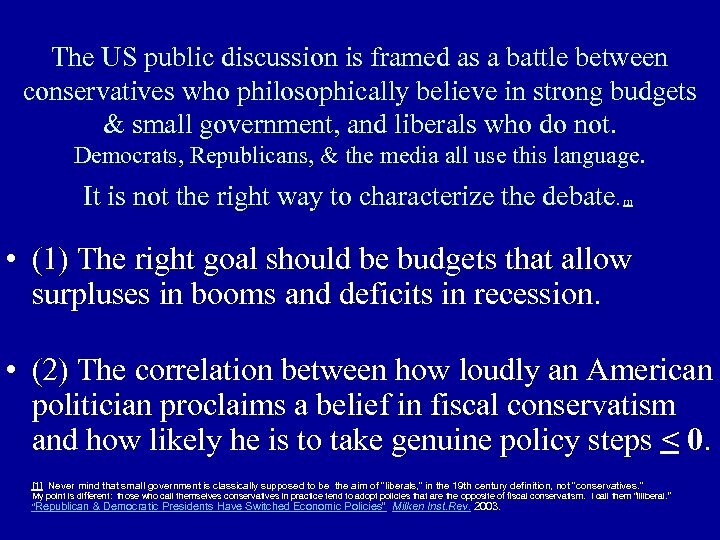 The US public discussion is framed as a battle between conservatives who philosophically believe in strong budgets & small government, and liberals who do not. Democrats, Republicans, & the media all use this language. It is not the right way to characterize the debate. • (1) The right goal should be budgets that allow surpluses in booms and deficits in recession. 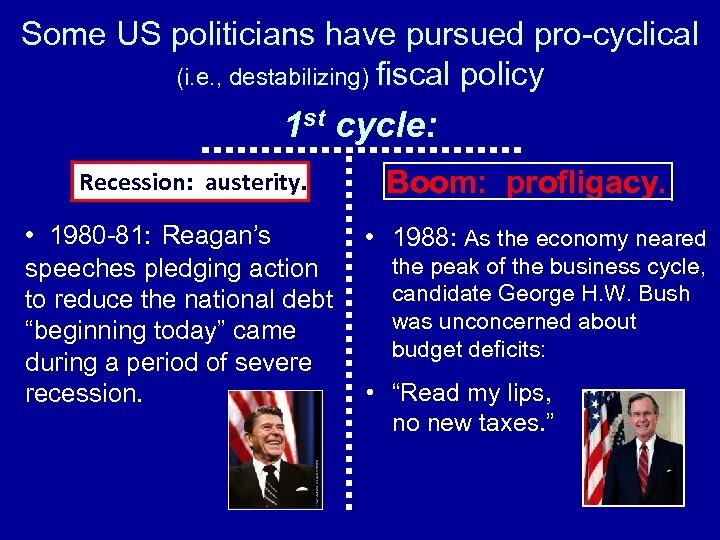 • (2) The correlation between how loudly an American politician proclaims a belief in fiscal conservatism and how likely he is to take genuine policy steps < 0. Never mind that small government is classically supposed to be the aim of “liberals, ” in the 19 th century definition, not “conservatives. 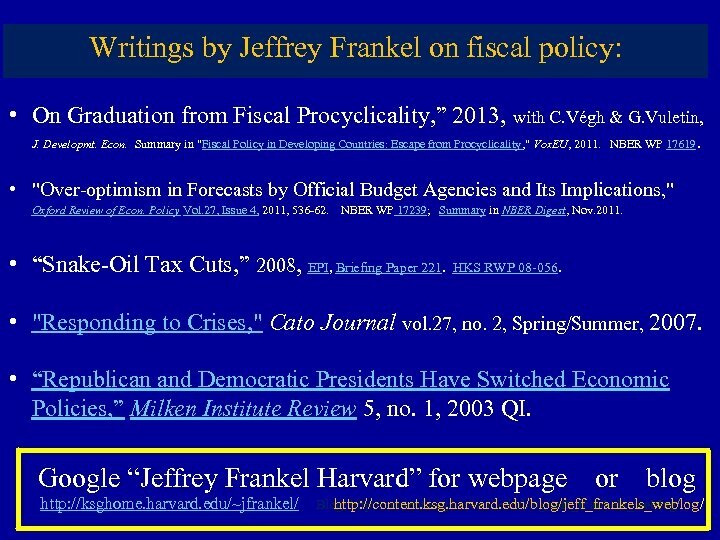 ” My point is different: those who call themselves conservatives in practice tend to adopt policies that are the opposite of fiscal conservatism. I call them “illiberal. 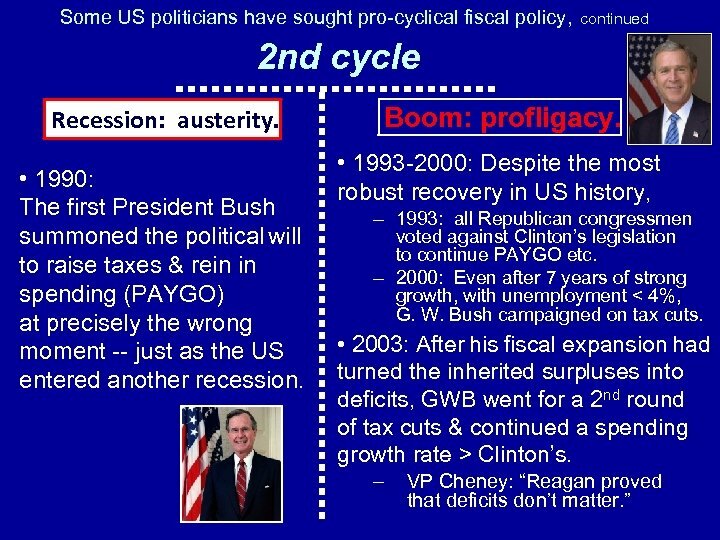 ” “Republican & Democratic Presidents Have Switched Economic Policies” Milken Inst. Rev. 2003. 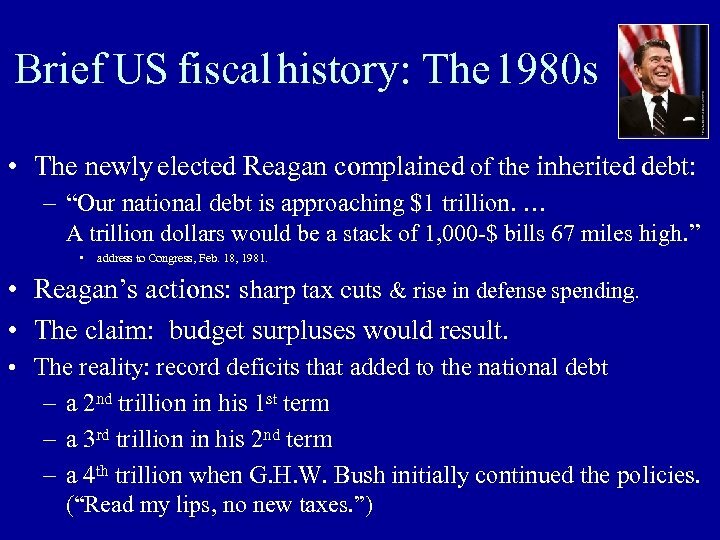 US fiscal history, continued: The 1990 s • The deficits were gradually cut, and then converted to surpluses by the end of the 1990 s. • How was this accomplished? – Regime of “Shared Sacrifice” -- 3 key policy events. 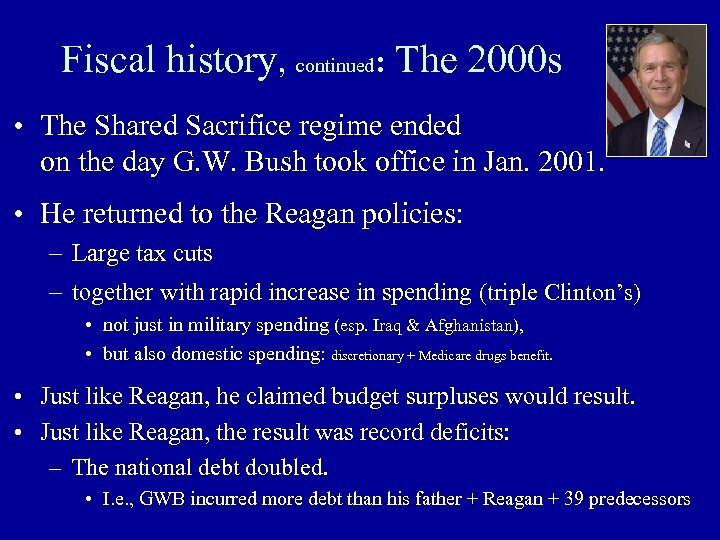 • 1990: GHW Bush bravely agreed spending caps, taxes & PAYGO • 1993: Clinton extended the policy. 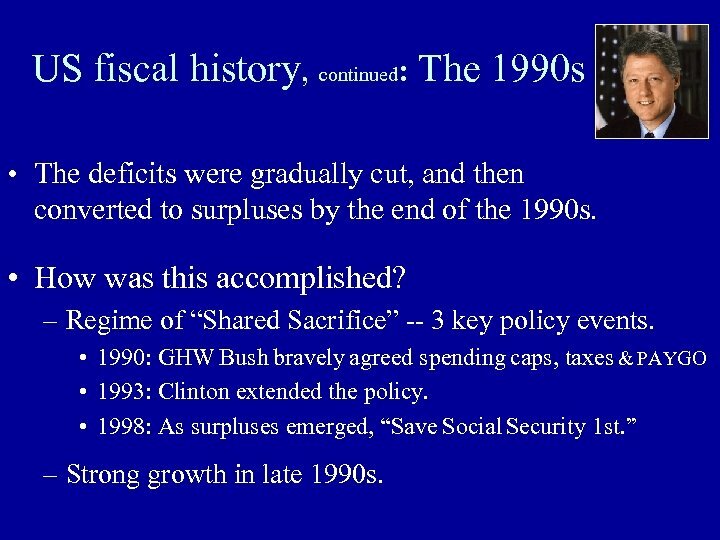 • 1998: As surpluses emerged, “Save Social Security 1 st. ” – Strong growth in late 1990 s.
Where are we now, in February 2013? • The political crisis: • repeated partisan standoffs in Congress. 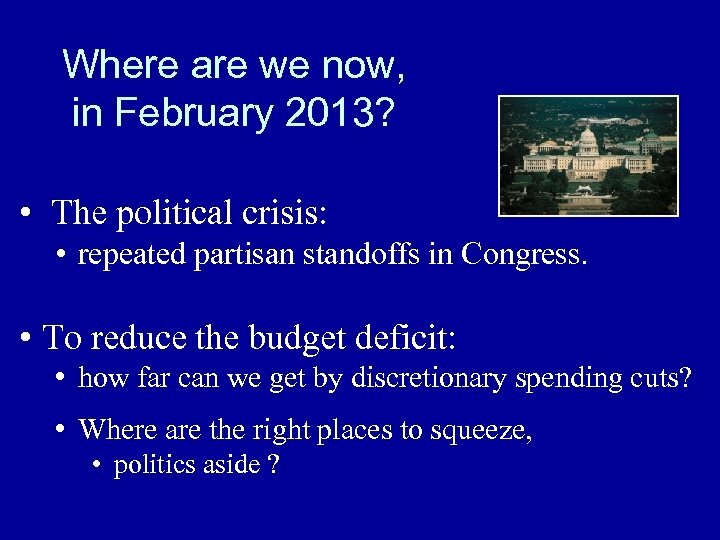 • To reduce the budget deficit: • how far can we get by discretionary spending cuts? • Where are the right places to squeeze, • politics aside ? Repeated partisan stand-offs in Congress have each ended by “kicking the can down the road. 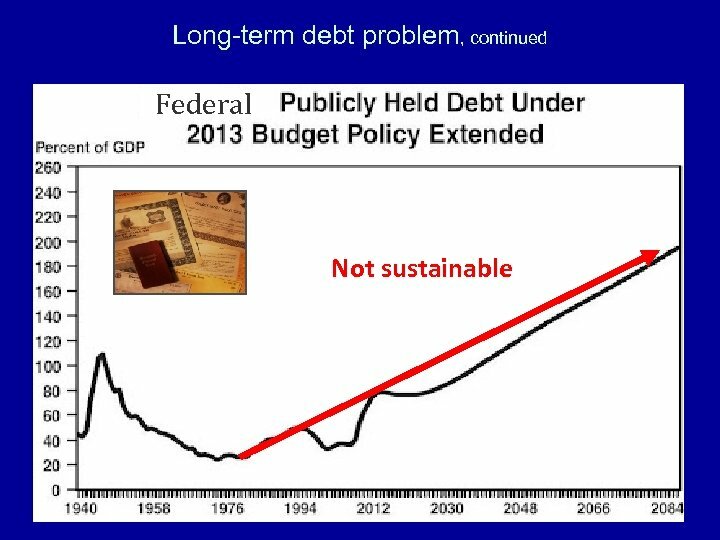 ” • In the summer of 2011, “fiscal conservatives” at first refused the usual debt ceiling increase, – recklessly threatening government default. – Political dysfunction led S&P to downgrade US bonds from AAA. 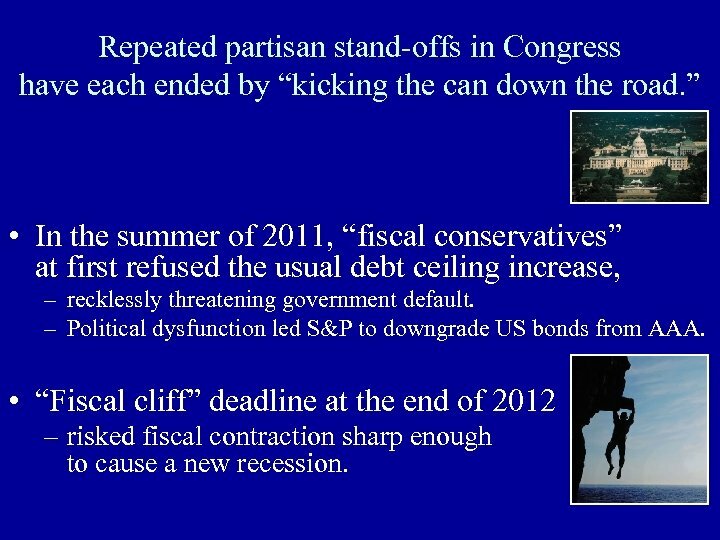 • “Fiscal cliff” deadline at the end of 2012 – risked fiscal contraction sharp enough to cause a new recession. Repeated partisan stand-offs, continued • More self-inflicted deadlines coming up: – Mar. 1 : Sequestration of discretionary spending hits (+) • $1. 2 tr. over decade, ½ defense, ½ domestic. – Mar. 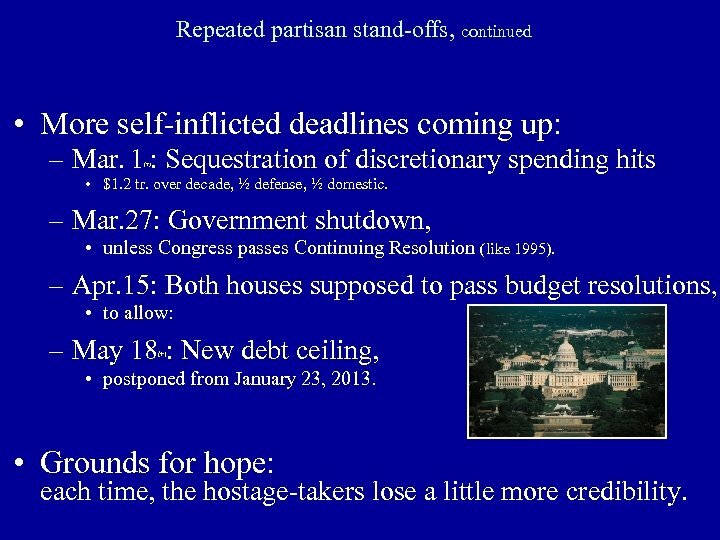 27: Government shutdown, • unless Congress passes Continuing Resolution (like 1995). – Apr. 15: Both houses supposed to pass budget resolutions, • to allow: – May 18 : New debt ceiling, (+) • postponed from January 23, 2013. • Grounds for hope: each time, the hostage-takers lose a little more credibility. 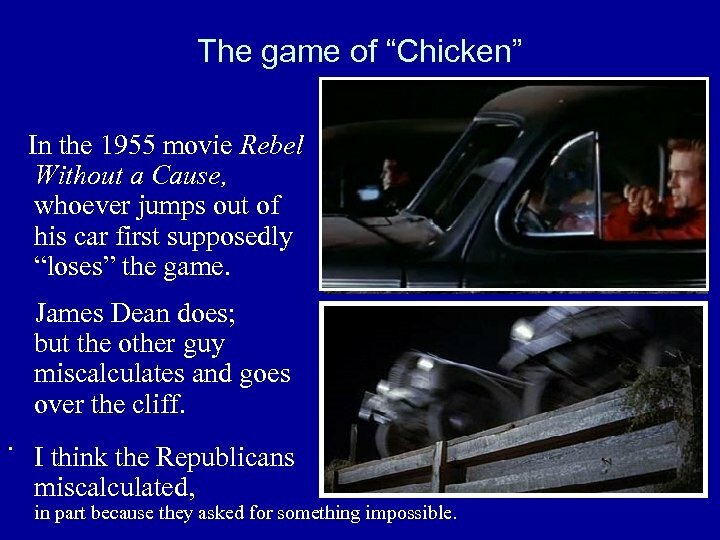 The game of “Chicken” In the 1955 movie Rebel Without a Cause, whoever jumps out of his car first supposedly “loses” the game. James Dean does; but the other guy miscalculates and goes over the cliff. . I think the Republicans miscalculated, in part because they asked for something impossible. How far can we get by cutting spending? 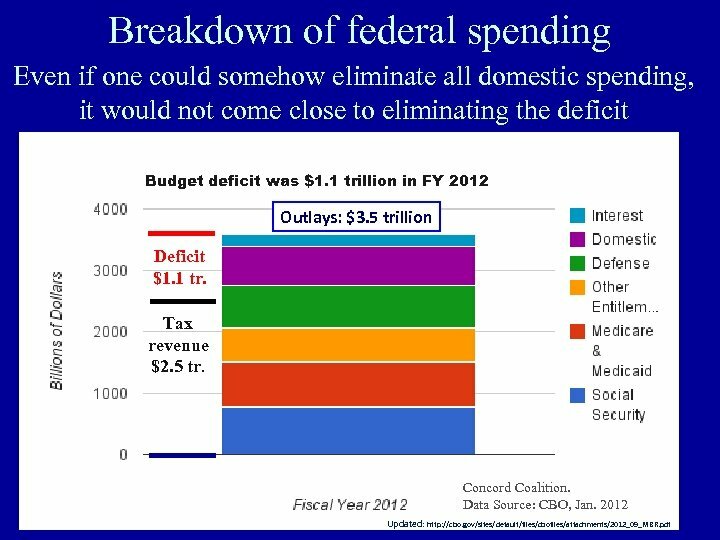 • Total federal spending = $3 ½ trillion in round numbers. 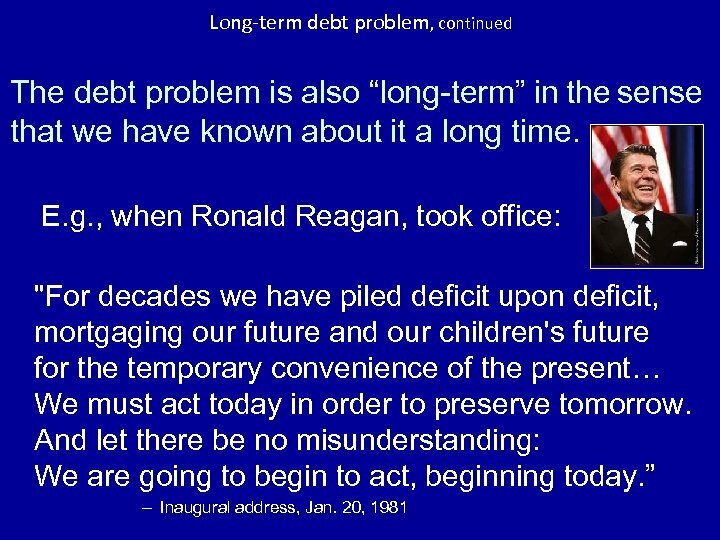 • That spending minus tax revenue left a budget deficit of $1. 1 trillion in FY 2012, • down from $1. 4 trillion in 2009. 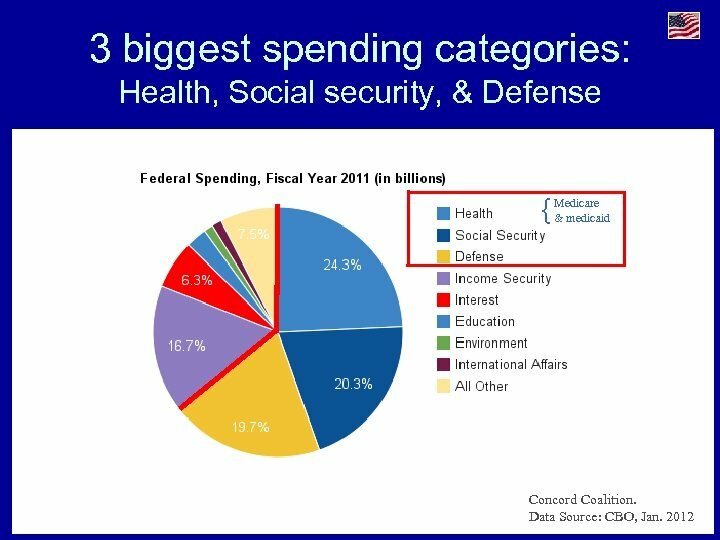 • Most Republican congressmen want to cut only non-defense discretionary spending, – to exempt defense & senior-related spending (Soc. Security & Medicare). • That was their official platform in the 2010 election. 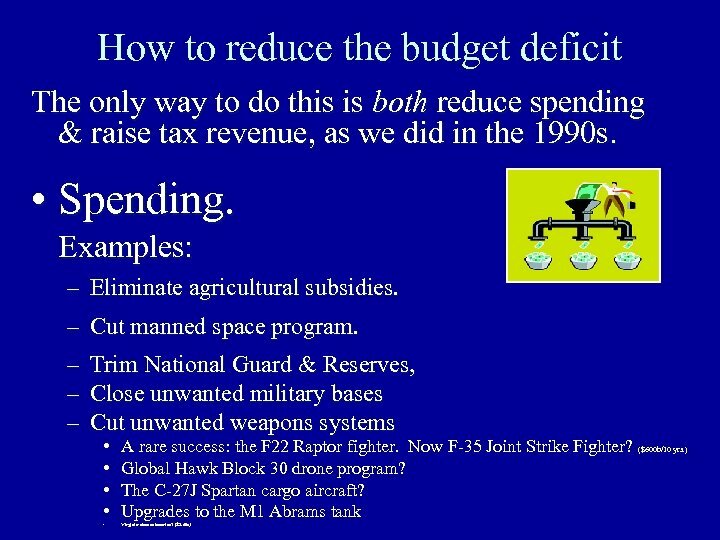 • How much would we have to trim non-defense discretionary spending to balance the budget? 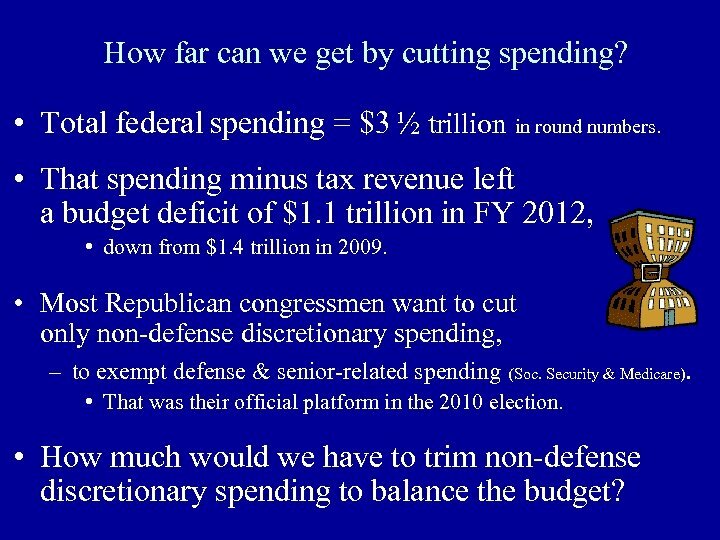 How far can we get by cutting spending? 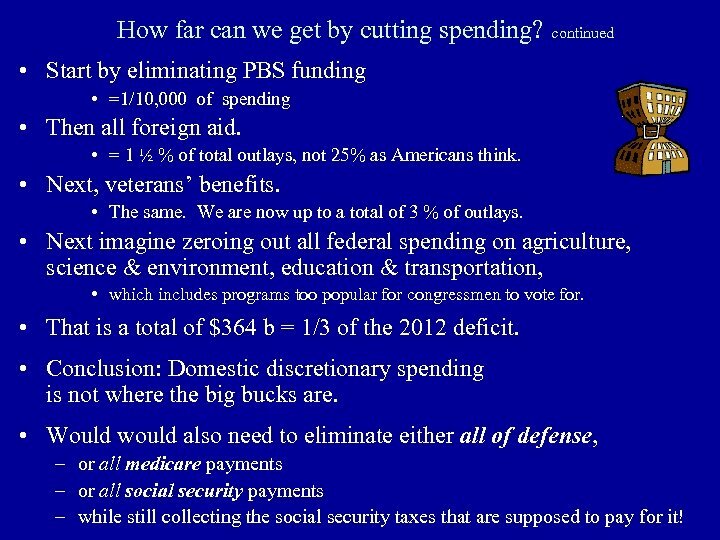 continued • Start by eliminating PBS funding • =1/10, 000 of spending • Then all foreign aid. • = 1 ½ % of total outlays, not 25% as Americans think. 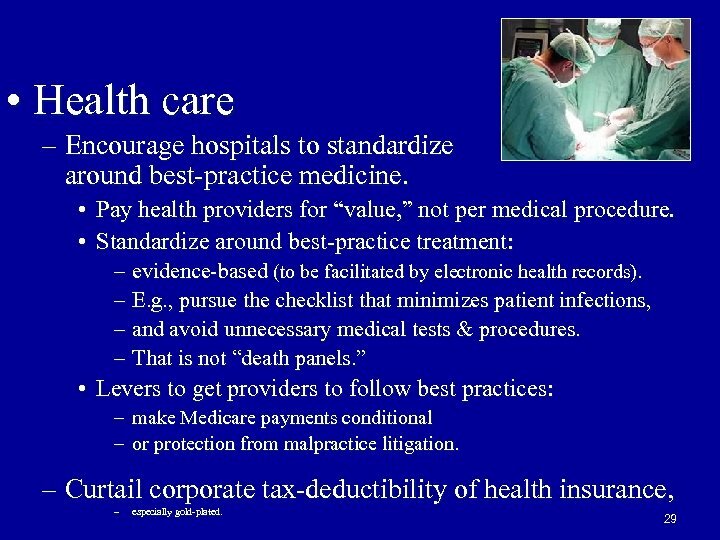 • Next, veterans’ benefits. • The same. We are now up to a total of 3 % of outlays. • Next imagine zeroing out all federal spending on agriculture, science & environment, education & transportation, • which includes programs too popular for congressmen to vote for. • That is a total of $364 b = 1/3 of the 2012 deficit. 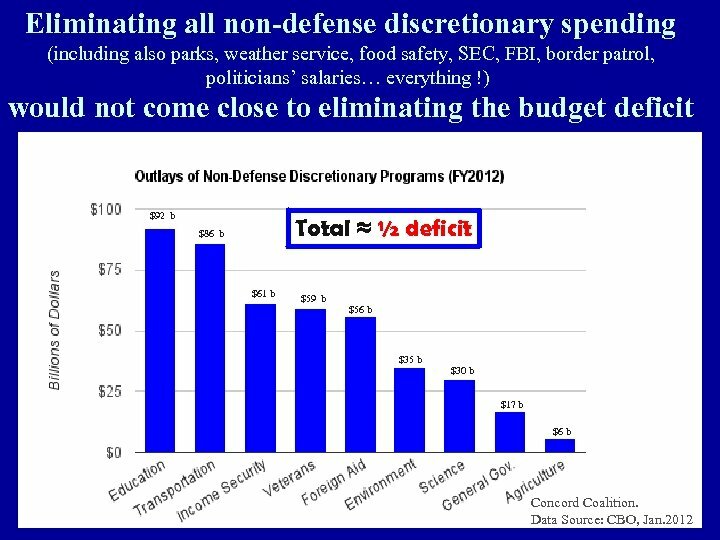 • Conclusion: Domestic discretionary spending is not where the big bucks are. 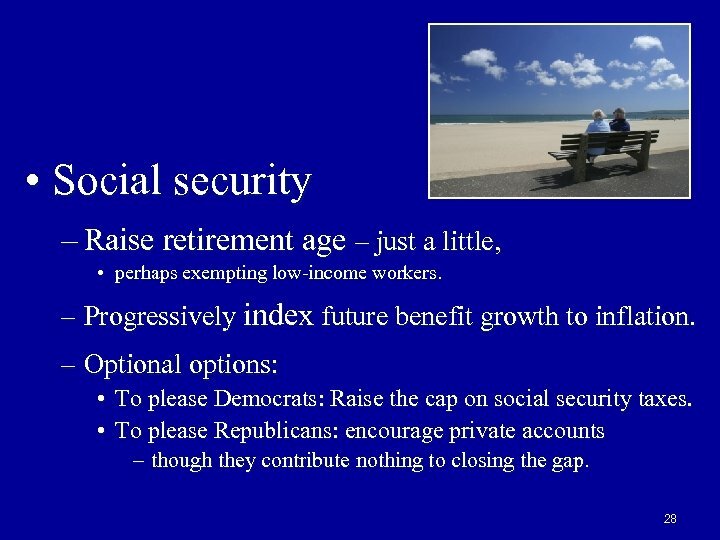 • Would would also need to eliminate either all of defense, – or all medicare payments – or all social security payments – while still collecting the social security taxes that are supposed to pay for it! 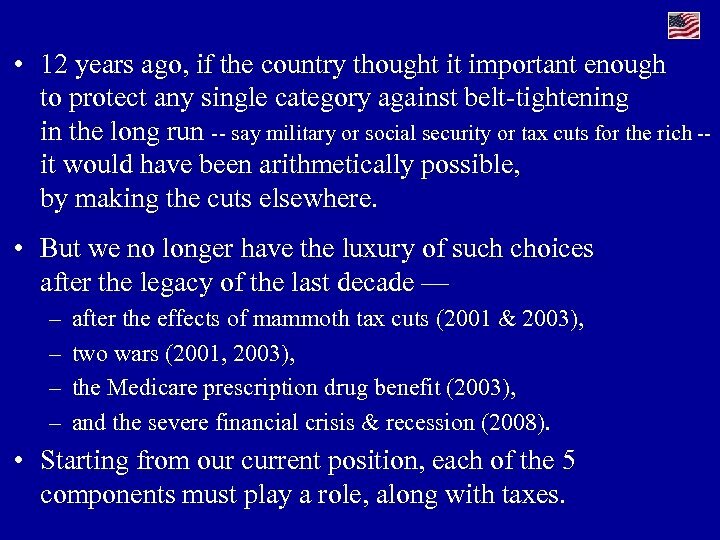 • 12 years ago, if the country thought it important enough to protect any single category against belt-tightening in the long run -- say military or social security or tax cuts for the rich -- it would have been arithmetically possible, by making the cuts elsewhere. 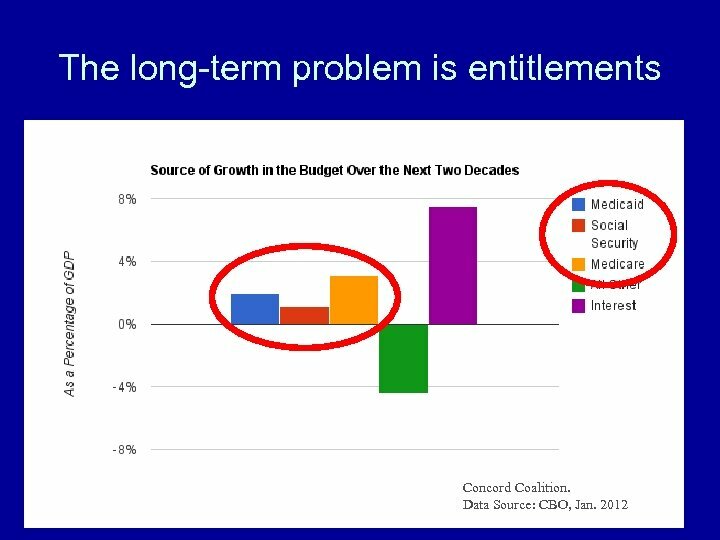 • But we no longer have the luxury of such choices after the legacy of the last decade — – – after the effects of mammoth tax cuts (2001 & 2003), two wars (2001, 2003), the Medicare prescription drug benefit (2003), and the severe financial crisis & recession (2008). • Starting from our current position, each of the 5 components must play a role, along with taxes. 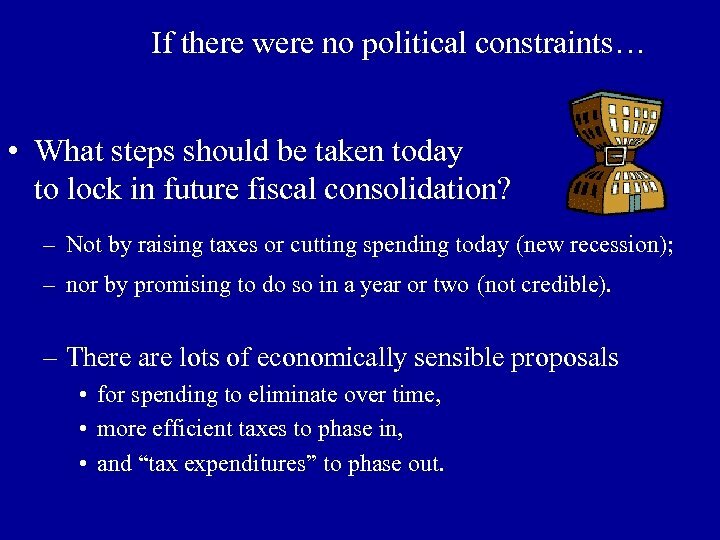 If there were no political constraints… • What steps should be taken today to lock in future fiscal consolidation? – Not by raising taxes or cutting spending today (new recession); – nor by promising to do so in a year or two (not credible). – There are lots of economically sensible proposals • for spending to eliminate over time, • more efficient taxes to phase in, • and “tax expenditures” to phase out. 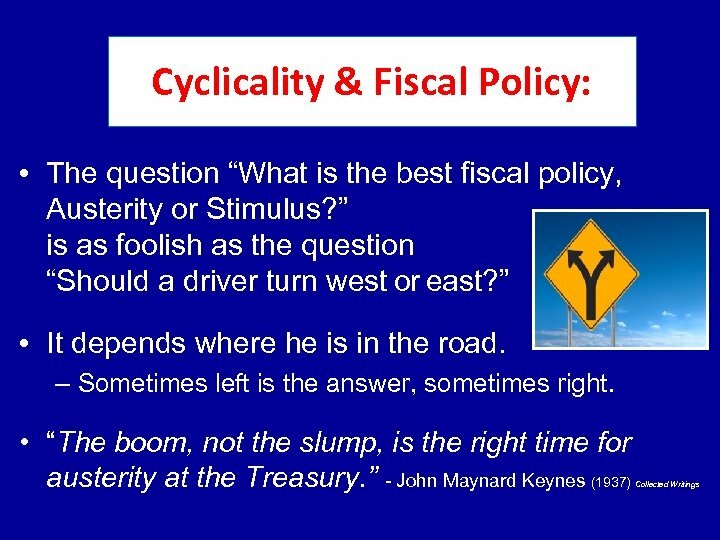 Cyclicality of Fiscal Policy, continued • During a period when some EM governments finally learned counter-cyclical fiscal policy (2000 -12) , many Advanced-Country politicians forgot how to do it. 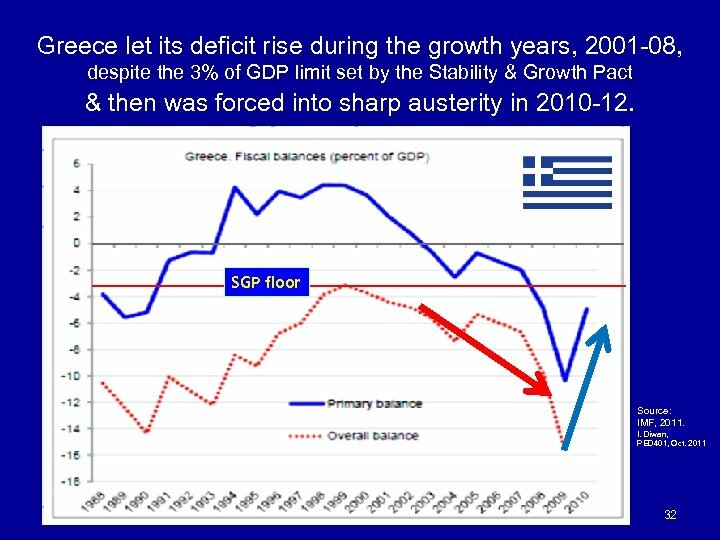 • Most conspicuously, Greece & other euro members failed to reduce budget deficits during years of growth, 2001 -08 – and were then forced to cut spending & raise taxes during the euro debt crisis of 2010 -12, • exacerbating recessions, even raising Debt/GDP. 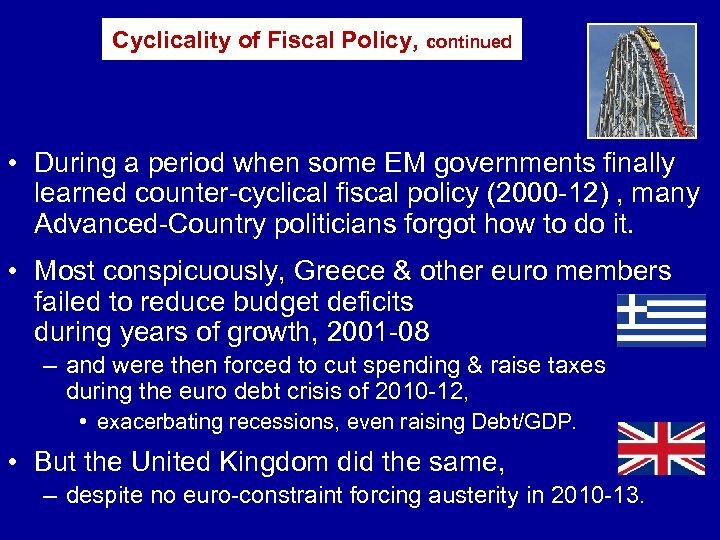 • But the United Kingdom did the same, – despite no euro-constraint forcing austerity in 2010 -13. 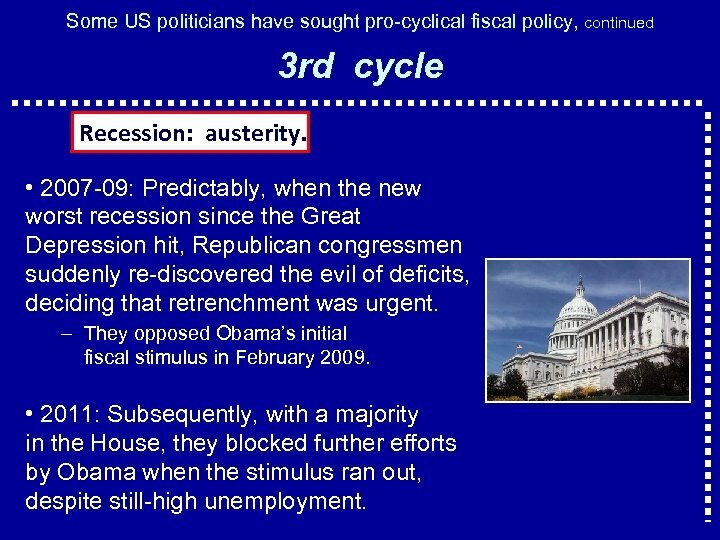 Some US politicians have sought pro-cyclical fiscal policy, continued 3 rd cycle Recession: austerity. 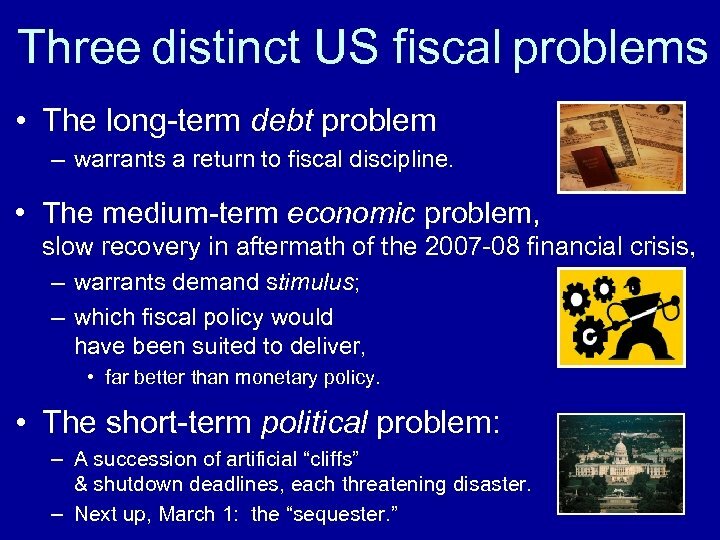 • 2007 -09: Predictably, when the new worst recession since the Great Depression hit, Republican congressmen suddenly re-discovered the evil of deficits, deciding that retrenchment was urgent. – They opposed Obama’s initial fiscal stimulus in February 2009. • 2011: Subsequently, with a majority in the House, they blocked further efforts by Obama when the stimulus ran out, despite still-high unemployment. 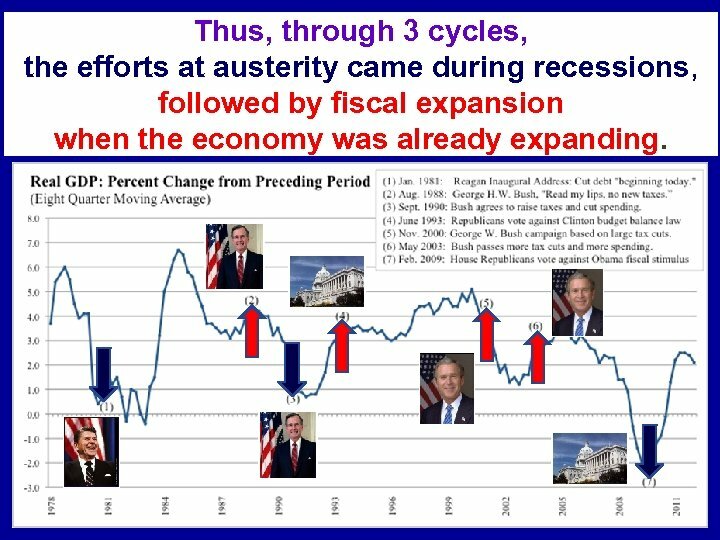 Thus, through 3 cycles, the efforts at austerity came during recessions, followed by fiscal expansion when the economy was already expanding. 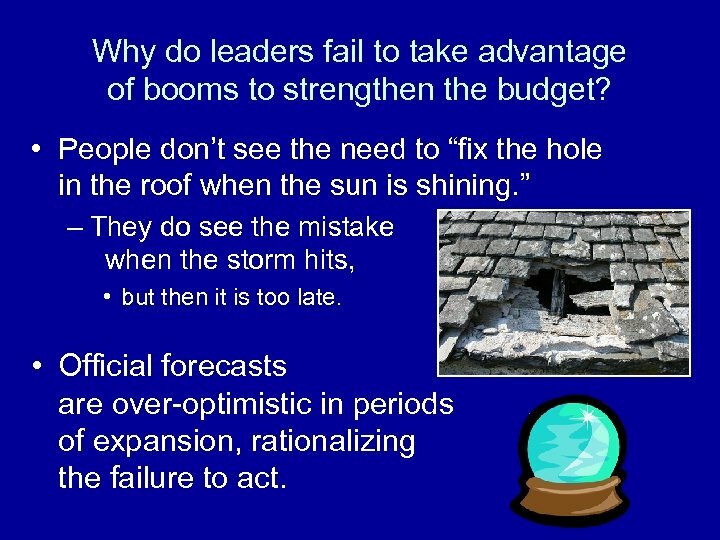 Why do leaders fail to take advantage of booms to strengthen the budget? • People don’t see the need to “fix the hole in the roof when the sun is shining. ” – They do see the mistake when the storm hits, • but then it is too late. • Official forecasts are over-optimistic in periods of expansion, rationalizing the failure to act. Failure to take advantage of booms to strengthen the budget, continued • Budget balance rules are in fashion. – EU: SGP, Debt brake, Fiscal compact. – US: State budget limits; Debt ceiling, Proposed Balanced Budget Amendment. • But they worsen the problem of over-optimistic forecasts. 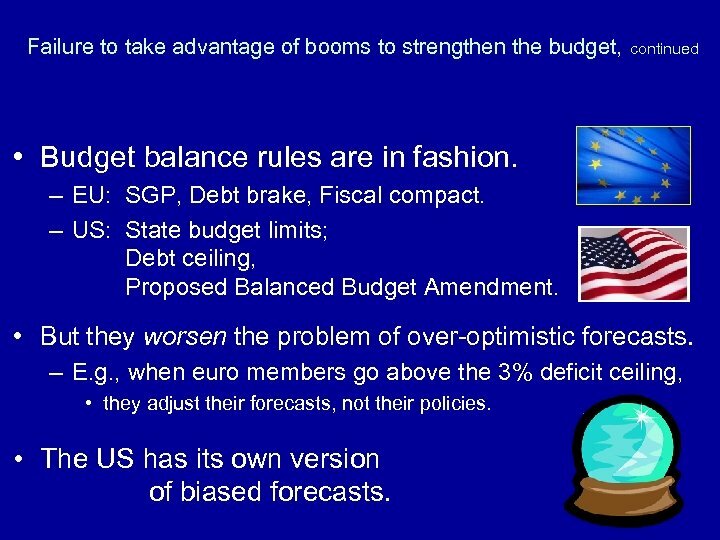 – E. g. , when euro members go above the 3% deficit ceiling, • they adjust their forecasts, not their policies. 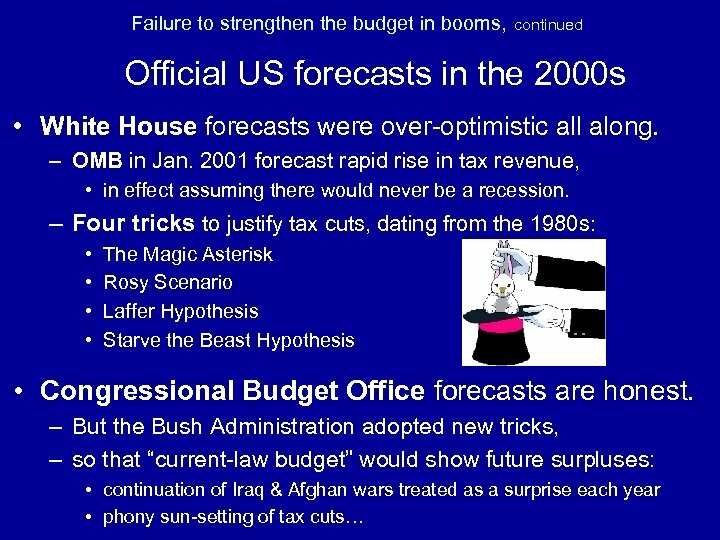 • The US has its own version of biased forecasts.